Padded Perimeter in restaurant design is applied as a long upholstered banquette back that encompasses one or more walls, in effect, acting as a low three-dimensional wall. The Padded Perimeter appeared as an interior archetypical practice at the turn-of-the-twentieth century. Surprisingly booth or banquette seating was adopted first in residential dining rooms at about the same time as in bars and restaurants. Padded Perimeter became an often-used treatment for wall organization and as a defining architectural element. In the 1911 Salon of the Lisbeth Steckelberg Apartment Josef Hoffmann located a U-shape booth in one corner of the room. The height of the padded and upholstered back is approximately double the seat height.2 By 1912, however, Hoffman’s idea of a high booth back that serves as a wall element (a Padded Perimeter) took shape in the Graben Café, Vienna.3 In this instance, the back wrapped around two walls, effectively elongating the horizontal effect. The back height was also been adjusted higher on the wall. In the 1930 decade the linear booth, comprised of a rectangular table between two booths facing each other, was the first booth configuration used in American diners. Early diners with narrow interiors included long counters and stools, and clientele was comprised almost exclusively to males. Booth seating made its appearance about 1929 in efforts to cater to women clientele. As the range of patrons grew from men to women and then families, upholstered booths provided more comfortable seating. Early booths were constructed of wood with matching benches. 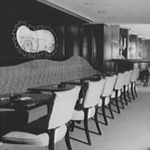 By the 1940 and 1950 decades, booths were made of tubular steel and upholstered in Naugahyde, a trade name widely used to describe all brands of artificial leather made from polymer vinyl and coated plastic.4 Booth seating for restaurants also included round booths that could seat five to seven people at a round table. Linear diner booths and round booths created more enclosure than tables and chairs which enhanced the privacy and intimacy of the dining experience for patrons in diners, cafes or restaurants. Fine dining restaurants in the 1940s were the first to incorporate a banquette, an upholstered couch fixed to the wall with a table placed in front of it. Most often, the banquette configuration seats four people using the bench for two and two chairs. Banquettes maximize seating by filling up corners and allowing more guests to be seated than would fit at tables with individual chairs.5 The button-tufted Padded Perimeter in the Monte Carlo Cinema restaurant (1946) in Chicago is one of the earliest examples. The Monte Carlo Padded Perimeter integrates three walls of the U-shaped dining area. The Padded Perimeter balances elaborate ceiling and wall treatments. By the 1960s and 1970s reiterations of Padded Perimeter were in common use in fine restaurants as lengthy low walls. During the 1980 decade Padded Perimeters most often appeared with Billboard in the form of mirrors or murals. For example, the design for the Woods Gramercy restaurant (1985) featured a black Padded Perimeter above which were hung four-feet-high mirror planes. The Square One restaurant design (1990) offers another reiteration of a Padded Perimeter paired with a Billboard, In this example, the muralist, Carlo Marchiori, painted Il Paese della Cuccagna” (a veritable Canaletto of edibles) on the wall above the long banquette seat. 1) Adolf Loos Apartment and American Bar  Adolf Loos; Vienna in Roff Toman, ed., Vienna Art and Architecture (Cologne, Germany: Konemann, 1999), 312-313. 2) Salon, Lisbeth Steckelberg Apartment  Josef Hoffmann; Vienna in Peter Noever, ed. Yearning for Beauty: The Wiener Werkstatte and the Stoclet House (Brussels, Belgium: MAK Vienna and the Centre of Fine Arts Brussels, 2006, 94. 3) Graben Café  Joseph Hoffman, Vienna in Peter Noever, ed. Yearning for Beauty: The Wiener Werkstatte and the Stoclet House (Brussels, Belgium: MAK Vienna and the Centre of Fine Arts Brussels, 2006), 100. 4) Larry Cultrera, American diner expert, e-mail message to author, July 25, 2008. 5) Costas Katsigris, Design and Equipment for Restaurants and Foodservice: A Management View (Hoboken, N.J.: John Wiley, 2006), 44. 6) Donna Paul, “Rock the Casbah,” Interior Design 75, no. 3 (Mar. 2004): 268. 7) Evidence for the use and the chronological sequence of Padded Perimeter as a restaurant archetype was developed from the following sources: 1940 The Monte Carlo Cinema Club  Franklin Hughes, Interior Design; Chicago, IL in Lisa Skolnik, "MOD is in the Details," Interiors 106, no. 1 (Aug. 1946): 96; PhotoCrd: Anonymous / 1960 Restaurant Vasata  Norbert L. Troller, AIA, Architect; New York City in "Restaurants," Interior Design 31, no. 4 (Apr. 1960): 149; PhotoCrd: Motal; Safari Lounge, Paul Young's Restaurant  William Pahlmann Associates, AID, Interior Design; Washington D.C in "Restaurants," Interior Design 31, no. 10 (Oct. 1960): 163; PhotoCrd: Anonymous; Heather House Restaurant, Carson, Pirie, Scott and Co. Department Store  Hal Lorey, Interior Design; Chicago, IL in "Restaurants," Interior Design 32, no. 4 (Apr. 1961): 149; PhotoCrd: Idaka; President's Walk Restaurant  Idea Associates; Chicago, IL in "President's Walk," Interior Design 32, no. 6 (June 1961): 135; PhotoCrd: Hedrich Blessing; Chateau Fleur de Les Restaurant  Alan L. Ferry and Hugh Latta; Atlanta, Georgia in "Restaurants," Interior Design 37, no. 4 (Apr. 1966): 190; PhotoCrd: Alexandre Georges; Orangaire Tea Room, National Hotel and Motel Exposition, New York City  Umberto Marucci, AID, Chandler Cudlipp Associates, Interior Design in Anonymous, "Designs for Dining," Interior Design 38, no. 10 (Oct. 1967): 152; PhotoCrd: Anonymous; Walnut Mall Shopping Center  Brock Arms, AIA, NSID; Petersburt, VA in "Cater to the Busy Shopper," Interior Design 40, no. 5 (May 1969):153; PhotoCrd: Anonymous / 1970 Gatsby's Restaurant  Joseph Braswell, AID, Interior Design; New York City in "The Greats at Gatsby's," Interior Design 41, no. 4 (Apr. 1970): 133; PhotoCrd: Anonymous; Dining Complex, E.R. Squibb and Sons Headquarters ; Jerome J. Sincoff, Principal, David Shuttle, Designer, HOK; Lawrenceville, NJ in "HOK," Interior Design 43, no. 9 (Sep. 1972): 137; PhotoCrd: Alexandre Georges; The Big Four Restaurant  Anthony Hail; San Francisco, CA in "The Big Four on Nob Hill", Interior Design 49, no. 4 (Apr. 1978): 233; PhotoCrd: William A. Porter / 1980 Clyde's at Tysons Corner  John Richards Andrews; Fairfax County, VA in Monica Geran, "Clyde's at Tysons Corner," Interior Design 51, no. 12 (Dec. 1980): 159; PhotoCrd: Mark Ross; Woods Gramercy  James D'Auria Associates; New York City in Monica Geran, "Prepared to Order," Interior Design 56, no.1 (Jan. 1985): 265; PhotoCrd: Norman McGrath; Tiger, Tiger Teahouse  Joyce/Snweiss Design Group; Miami, LF in Monica Geran, "Tiger, Tiger," Interior Design 59, no.10 (Oct. 1988): 233; PhotoCrd: Steven Brooke / 1990 Square One  Andrew Belschner Joseph Vincent, San Francisco, CA in "Square One Recombinant," Interior Design 45, no. 1 (Apr. 1990): 163; PhotoCrd: John Vaughan; Remi Redux  Adam Tihany; New York City in "Remi Redux," Interior Design 61, no. 9 (Sep. 1990): 185; PhotoCrd: Peter Paige; Yello Giraffe  Arthur de Mattos Casas; Sao Paulo, Brazil in "Jungle Fever," Interior Design 67, no. 14 (Nov. 1996): 96; PhotoCrd: Tuca Reines; Bondst  Studio Gaia; New York City in David M. Joseph, "Zen and the Art of Dining," Interior Design 70, no. 11 (Sep. 1999): 210; PhotoCrd: David M. Joseph / 2000 Kosushi Bar  Arthur de Mattos Casaa; Sao Paulo, Brazil in Monica Geran, "Sushi e Sake," Interior Design 71, no. 8 (Apr. 2000): 167; PhotoCrd: Tuca Reines; Sushi Jones  Mark Oller & Victoria Kirk of MOVK; New York City in Jen Renzi, "A Clean Palette," Interior Design 72, no. 11 (Sep. 2001): 118; PhotoCrd: Mark Ross; Opaline  Nicholas Budd Dutton; Los Angeles, CA in Kathryn Harris, "Shine On," Interior Design 75, no. 2 (Feb. 2004): 168; PhotoCrd: Eric Laignel; Chez Es Saadda  Patkin; New York City in Donna Paul, "Rock the Casbah," Interior Design 75, no. 3 (Mar. 2004): 268; PhotoCrd: Eric Laignel; Washington Square  Rockwell Group, Philadelphia, PA in Jorge S. Arango, "The Secret Garden," Interior Design 76, no. 8 (June 2005): 206; PhotoCrd: Eric Laignel; Coconut Groove  Bender Design; Miami, FL in Joachim Fischer and Martin Nicholas Kunz, eds., Café and Restaurant Design (Stuttgart, Germany: teNeues, 2007), 95; PhotoCrd: Friedrich Busam; Blue Velvet  Mandi and Mehdi Rafaty; Los Angeles, CA in Edie Cohen, "Into the Blue," Interior Design 78, no. 9 (July 2007): 60; PhotoCrd: Eric Axene; Dolder Grand  Foster and Partners and United Designers; Zurich, Switzerland in Craig Kellogg, "The Dolder, Bolder," Interior Design 79, no. 8 (June 2008): 269; PhotoCrd: Edmund Sumner. 2) Cho, Jasmin. “Theory Studies: Archetypical Practices of Contemporary Restaurant Design.” M.A. Thesis, Cornell University, 2009, 113-125.